The suit filed by the wife of the former President, Patience Jonathan, challenging a “No Debit Order” placed on some bank accounts came up for mention today at the Federal High Court sitting in Lagos. The four bank accounts in contention have a combined total of about $9m. Justice Chukwujeku Aneke is hearing the matter for the first time after the elevation of the former trial judge, Justice Mohammed Idris. At today’s proceedings, Counsel to Mrs Jonathan, Ifedayo Adedipe (SAN) told Justice Aneke that the matter was to start afresh following Justice Idris elevation. He also mentioned to the judge that his client had to amend her statement of claim to correctly reflect the change in name of Skye bank to Polaris Bank. Other lawyers in the case confirmed this position to the court. They also mentioned that as a result of Mrs Jonathan’s amendment, they would need to also amend their documents, file and serve the same. 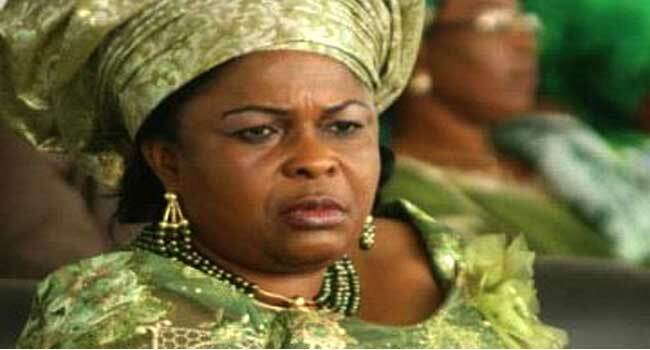 Justice Aneke agreed to allow parties to align their documents and processes and adjourned the case to May 22. Patience Jonathan had filed the suit in 2016 to challenge the order placed on four Skye Bank (now Polaris Bank Ltd) accounts harbouring a total of $9.8m. She says the funds belong to her. She listed as defendants: The Economic and Financial Crimes Commission (EFCC), Polaris Bank Ltd, and three companies, Pluto Property and Investment Company Ltd, Seagate Property Development and Investment Company Ltd, and Trans Ocean Property and Investment Company Ltd.
Mrs Jonathan wants the court to declare that she is the owner of the funds in the accounts opened in the names of the three companies, and so, she is entitled to access the funds for her use and benefit. Patience Jonathan is also seeking an order, restraining the EFCC or any other person, from preventing her access to the funds. She is also seeking an order, discharging the “No Debit’Freezing Order” placed on the accounts of the companies.